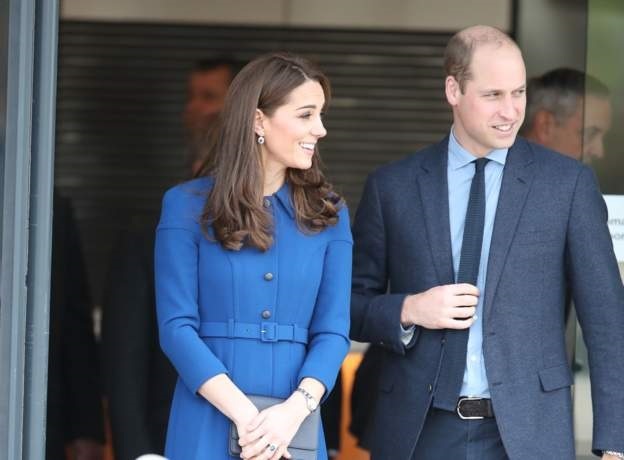 The Duke and Duchess of Cambridge today visited Rotherham and Barnsley in South Yorkshire. The visit was scheduled ahead of Prince Charles’ 70th birthday dinner in London tonight. 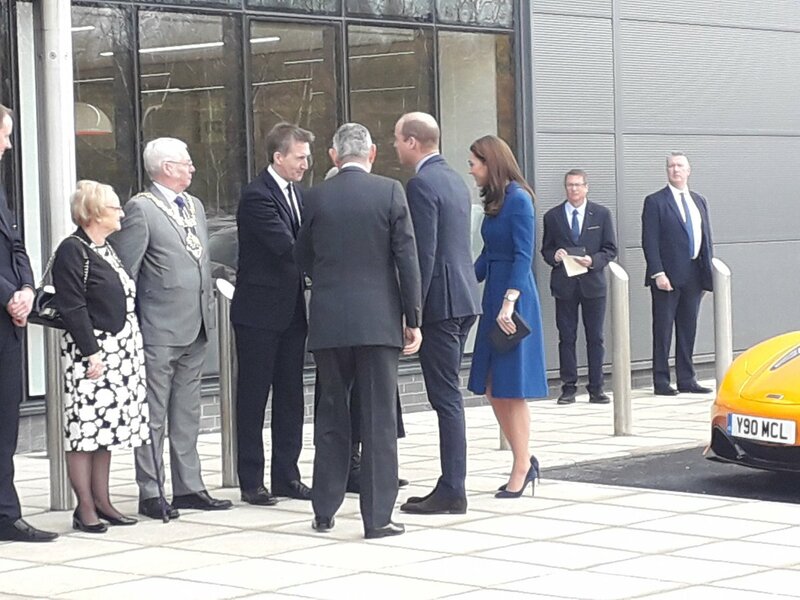 Upon arrival, the royal couple was welcomed by the Mayor of the Sheffield City Region Dan Jarvis and administration of McLaren Automative. In Rotherham William and Catherine officially opened McLaren Automotive’s 50M£ Composites technology center at Catcliffe. 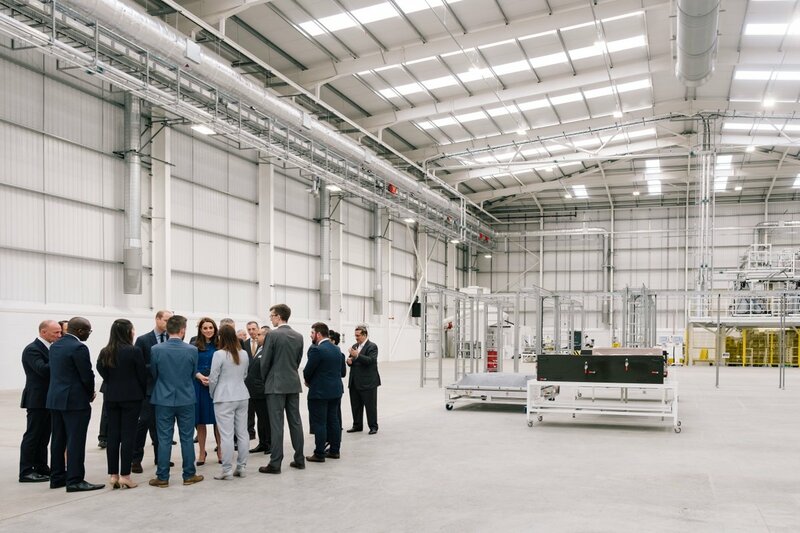 The McLaren Composites Technology Centre (MCTC) aims to be a world-leader in innovating lightweight carbon fibre and composites that will work together with future powertrain development to save weight and produce greater energy efficiencies. The new Center will be used to innovate the process of designing and constructing lightweight carbon fibre tubes which form the internal shell of McLaren’s cars. 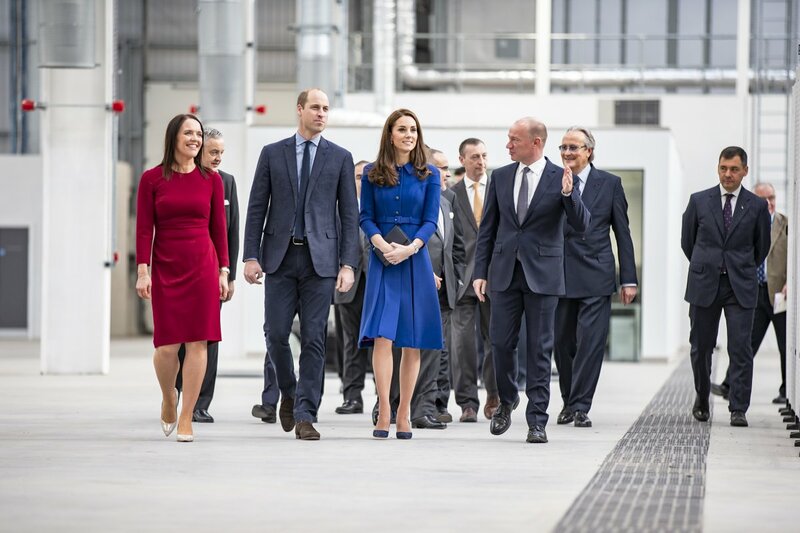 The royal couple was shown the prototype manufacturing line that includes industrial processes for cutting and fitting carbon fibre. 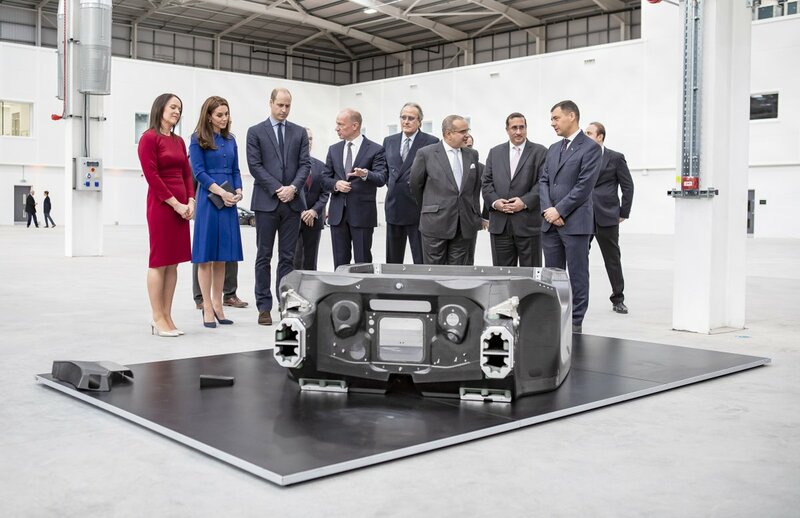 The carbon fibre car chasis produced here will be assembled at McLaren’s site in working, that Prince William visited last year. 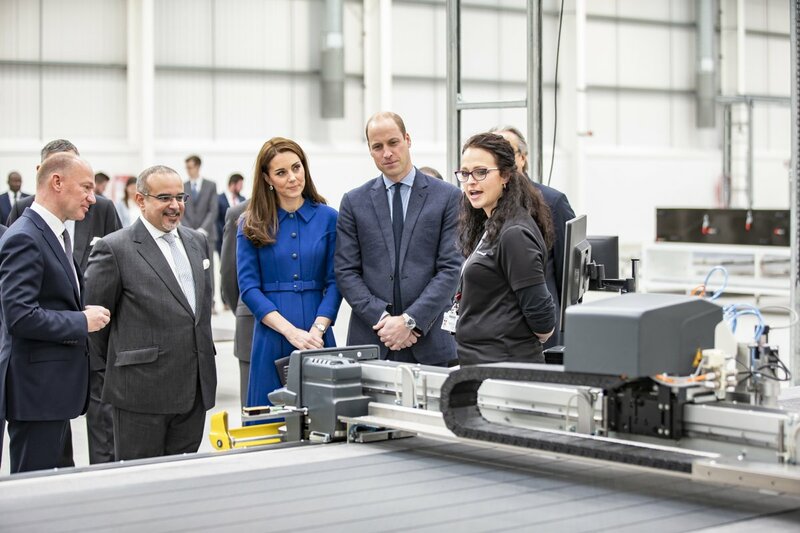 William and Catherine met with the factory employees and heard about the plans for the centre’s expansion that will be providing 200 new jobs for the local area when it will be fully operational by 2020. 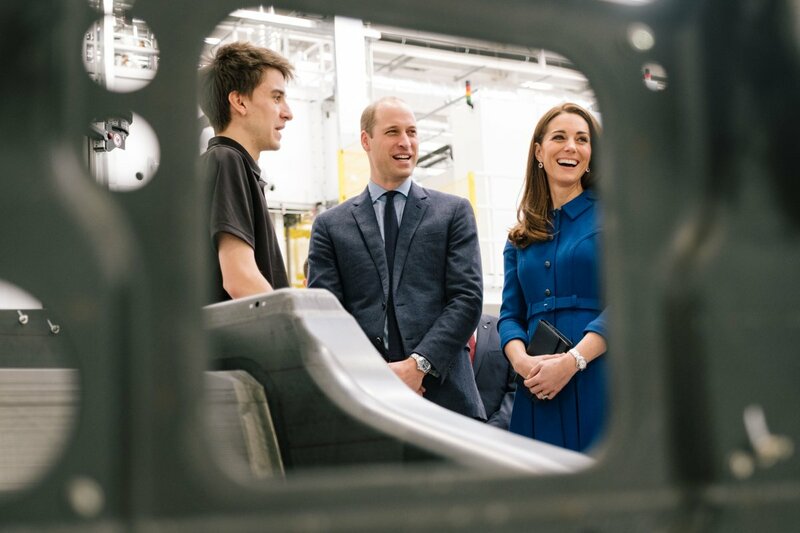 Duke and Duchess also met with some of the McLaren’s STEM Ambassadors and talked about their work encouraging children to get involved in science-based learning and careers. 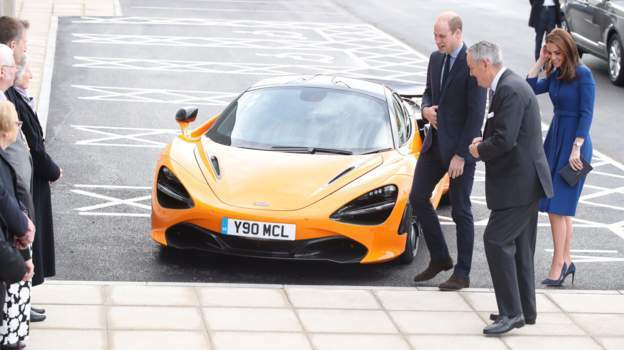 Prince William said he “looked forward to seeing more of them on the road” as he and Catherine departed from the McLaren factory in Rotherham after officially opening the site. They were joined by HRH Prince Salman bin Hamad Al Khalifa, the Crown Prince of the Kingdom of Bahrain. The next stop of the day was Barnsley where they visitrf Centrepoint Services. Centrepoint provides housing and support for young people in London, Manchester, Yorkshire and the North East and through partnerships all over the UK. As per its research report, 1,03,000 people in UK are homeless or at risk. It supports 10,000 young people every year with the age group of 16-25 year olds into a safe place to live, give them a health assessment and plan support for their individual mental and physical health needs and give them a start to a path of more independence and a job. The service centre in Bansley, supports over 60 young people from the area every day. Last year 7000 people in the Yorkshire and Humber approached the authorities to help. 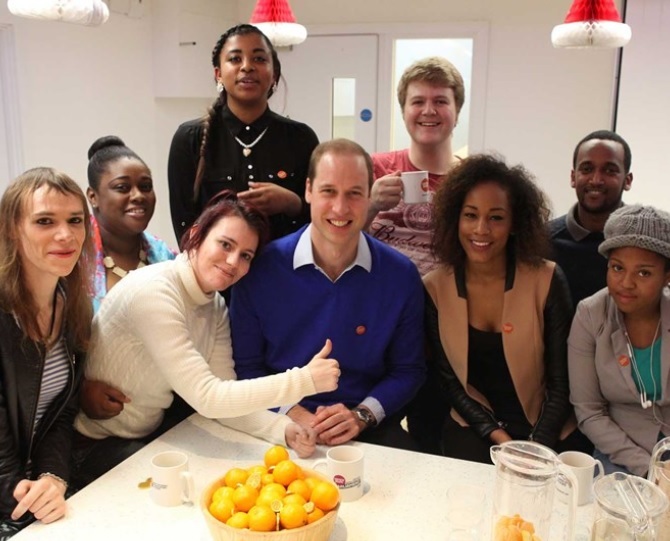 The charity holds a special place in Prince William’s heart. It was his mother Late Princess of Wales Diana’s patronage from 1992 to until her death in 1997. 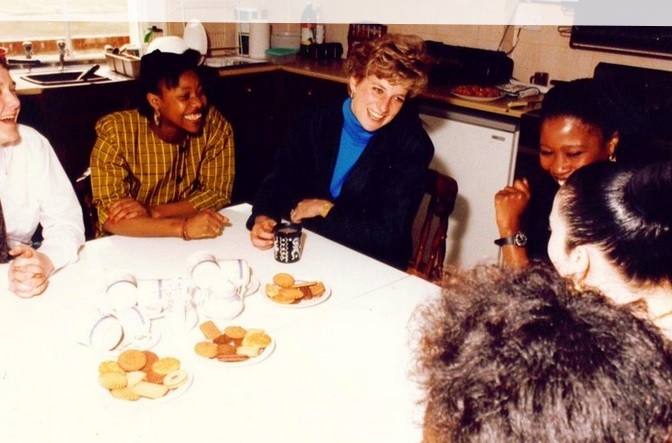 Both William and Harry would visit Centrepoint hostels when they were child with their mother and, when it was his turn to take over some of her patronages, Centrepoint was the first one he chose. He became its patron in 2005. 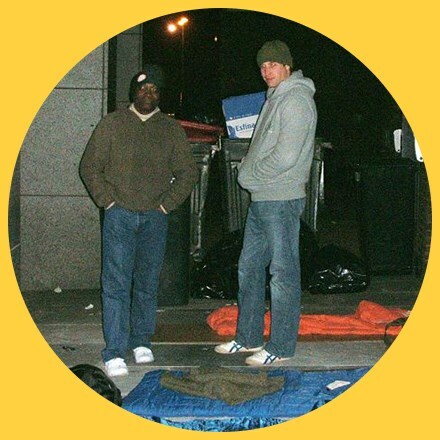 To deepen his understanding of the challenges homeless people face and highlight the issue of homlessness, in December 2009, Prince William joined Centrepoint’s CEO, Seyi Obakin, to spend a night sleeping out on the streets of London in temperatures as low as minus 4C. William and Catherine helped preparing lunch in the kitchen. These are some of the activities I love seeing William and Catherine participating. At the Kitchen William stirred Omero’s Red Pepper and Chorizo soup while Catherine sliced some bread. 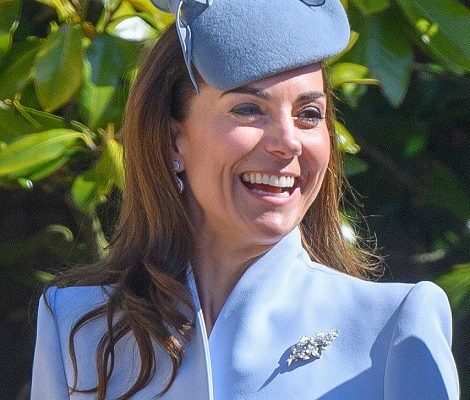 While cutting the bread, Duchess joked,” Don’t look at how evenly I cut it!” William also had a bite while talking to the youngsters. The soup the couple served is part of the ‘Big Broth’ project which raises money for Centrepoint and is now on sale at Waitrose and the Ocado online grocer. They met with residents and talked about their experiences and learn how the Centrepoint Service helped them. 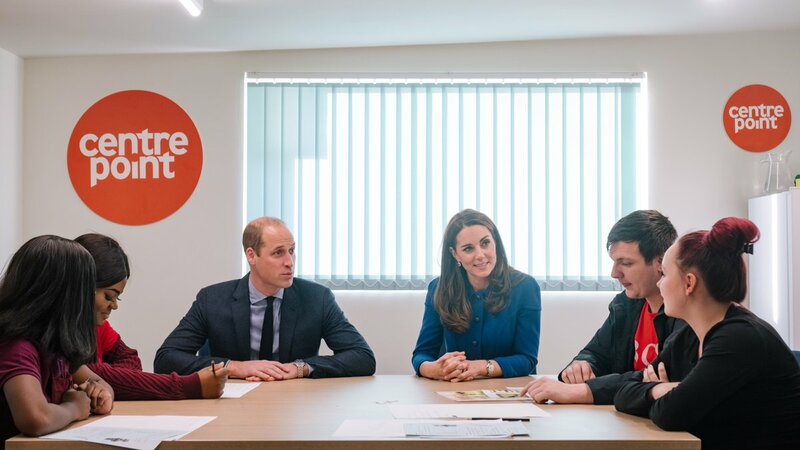 After the lunch, William and Catherine visited Centre’s new Andy Norman Learning Hub. The hub has been built to provide a dedicated space and resources to young people at risk of homelessness in Barnsley. The hub help them to improve their skills and move towards independent life. The couple met with the young people who are being helped by the hub. 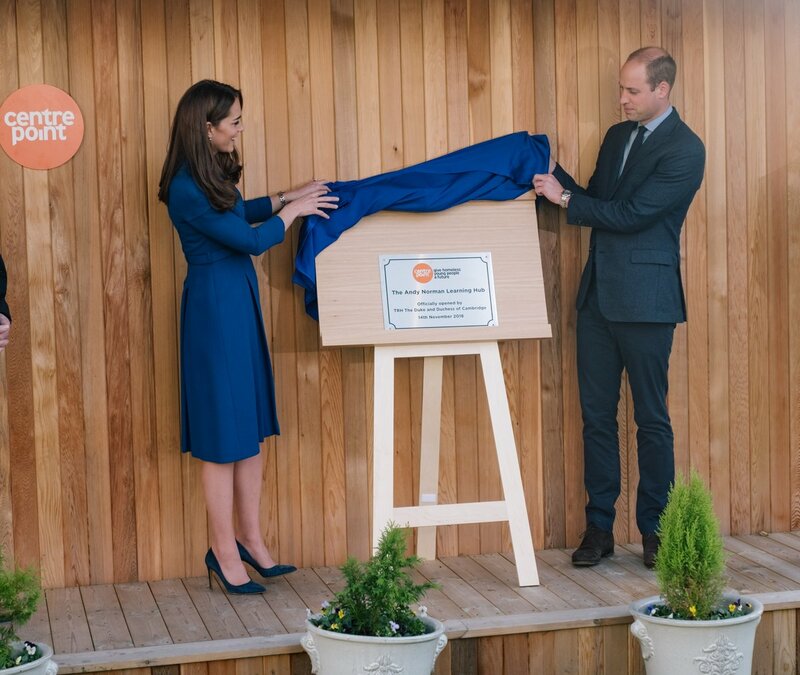 The couple officially opened the hub today. 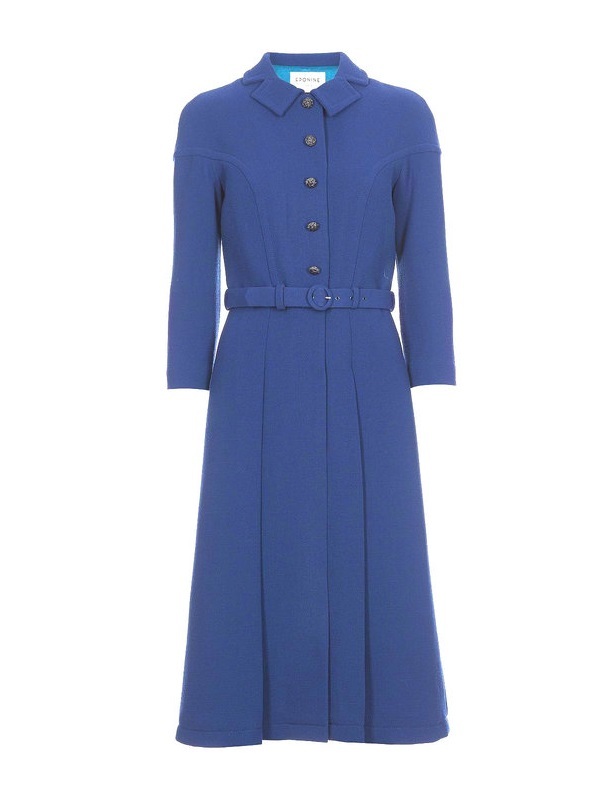 She first wore Sapphire Blue Eponine Coat Dress to visit Anna Freud Centre in January 2017. The double wool crepe piece is from label’s 2017 Autumn-Winter Collection and features three quarter length sleeves, a collar with notch cut outs, a slender matching belt and wide pleats in the back. Catherine paired the outfit with Rupert Sanderson Malory Pumps. Premiered in January 2016, featuring Sanderson’s signature silhouette Malory Pumps have 100mm heel height and classic pointed toe. Duchess debuted a new navy hand bag today. 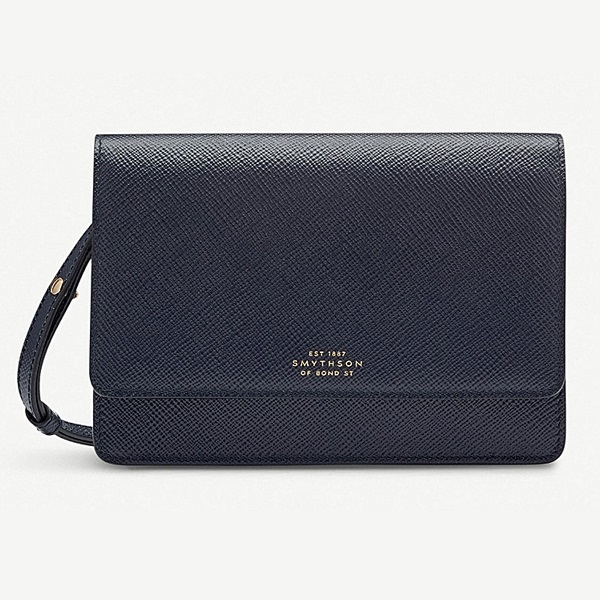 She carried Smythson Panama cross-grained leather purse with strap. The $785 bag features foldover front with magnetic button closure, removeable adjustable crossbody strap, back zipper pocket, internal zipper coin section, ten card slots, one slip note pocket, foiled metallic branding, tonal stitching, painted edges, smooth leather lining. Crafted from panama cross-grained leather, the bag is available on Selfridges in navy, Nile blue, pink, Gold and Cobalt. 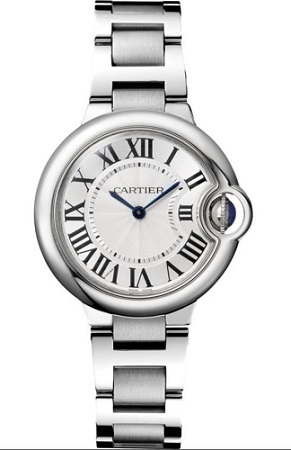 Catherine wore her Sapphire and Diamond Diana Earrings and Cartier Ballon Bleu watch. Tonight Queen Elizabeth is hosting a dinner at Buckingham Palace in the honour of Prince Charles’s 70th birthday. Many Foreign Royals are attending. 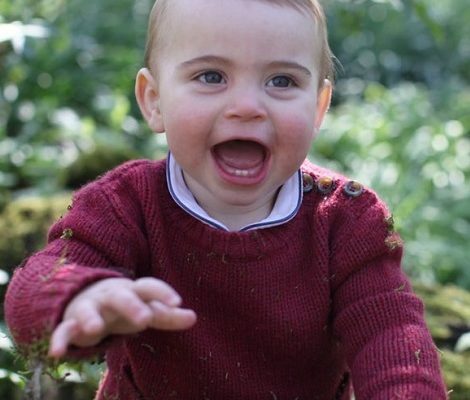 I hope the Extended British Royal Family will be there, so we can expect Duke and Duchess of Cambridge to be there. I hope we will get one or two portraits from the night.